PC Maximum Cleaner is the PUP that uses misleading techniques to prevent removal. Use Reimage to locate malicious components and get rid of them faster than with uninstall instructions. A full system scan blocks virus reappearance and prevents traffic to malicious domains. What is PC Maximum Cleaner? How can PC Maximum Cleaner hijack my computer? How to remove PC Maximum Cleaner? PC Maximum Cleaner is a questionable program that has been added to ‘potentially unwanted program’ category. The official site states: ‘this repair tool is designed to diagnose your PC problems and repair them quickly. It scans your PC and finds the problems and effectively fixes them. Having a clean and fixed computer helps running a faster restart process when needed, having less operating system errors and generally enjoying a faster PC operating system errors and generally enjoying a faster PC!’ However, we can’t guarantee that you will enjoy having this program on your computer. In reality, this system tool seeks just to scare its users and make them purchase its licensed version. In most cases, this program starts running its scanners as soon as it enters computer. It typically lists hundreds of different errors and claims that the only way to get rid of them is to use its licensed version. Beware that the most of these reported problems are fake. 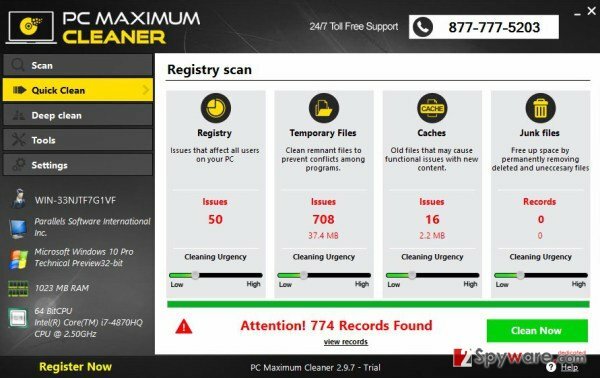 Whenever PC Maximum Cleaner scans the computer, it always finds bad registry entries, viruses and additional problems. The program works like this in order to make users think that computer is infected when actually there is no potential danger. Basically, the aim of this application is to scare the user and force him or her to purchase the full version of the PC Maximum Cleaner. Furthermore, PC Maximum Cleaner may block your access to internet stating that it was blocked due to security reasons. You may be asked to call a specific number to get help. You may also receive suggestions to install additional applications, but keep in mind that none of them will do any good. Plus, you may receive a greatly increased telephone bill because all these ‘free’ numbers are actually the paid ones. To sum up, you should stay clear of PC Maximum Cleaner and remove it without a delay. 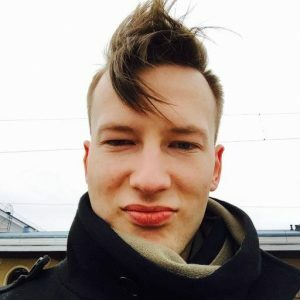 For that you can use Reimage, which will detect and eliminate all malicious software that is hiding on your computer. Here, find PC Maximum Cleaner. We also recommend you to install Reimage, Malwarebytes MalwarebytesCombo Cleaner or Plumbytes Anti-MalwareMalwarebytes Malwarebytes, and make sure that your computer is free of viruses. This entry was posted on 2015-09-24 at 07:02 and is filed under System tools, Viruses. You can quickly scan the QR code with your mobile device and have PC Maximum Cleaner manual removal instructions right in your pocket. How did you remove PC Maximum Cleaner?